Some products are a little hard to categorise. This one isn’t. This is the one-box system Musical Fidelity head honcho Antony Michaelson wanted for his own use. 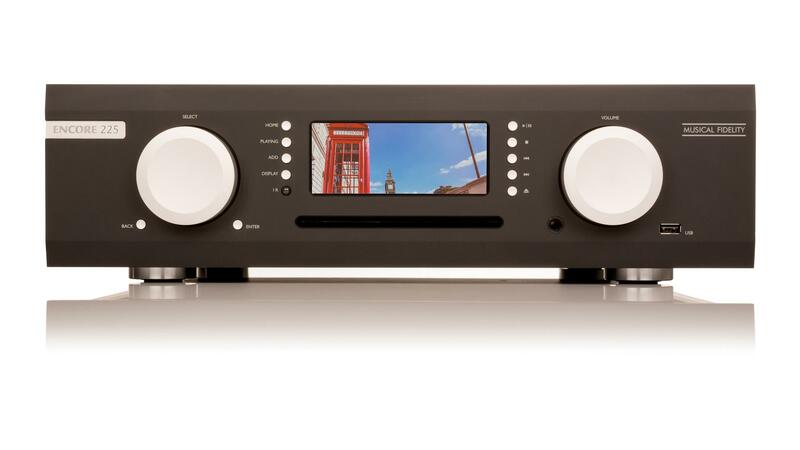 It’s not designed to fit a niche or a gap in the market, and it’s not yet another range-filler; the M6 Encore 225 was developed so that Antony could have a streaming, playing, ripping, all-in-one for his home. Antony figured that what he wants from a system is very likely what other people in his place want from a system. Normally, this would send alarm bells ringing, and visions of ‘Designer’s Folly’ models that only make sense to the engineer who dreamed them up come to the fore. But, in fairness, Antony has form. He has a track record of making things that he would like for himself, that go on to be hugely successful when sold to the public. It’s why classic Musical Fidelity designs like the A1 integrated amplifier happened; Antony wanted a small Class A integrated amplifier to make a great sound, and the world agreed. A more conservative boss would have made a more conservative product, one that was simultaneously more powerful and less capable of doubling up as a barbeque griddle, and it would have sold in conservative numbers. OK, so not all of Antony Michaelson’s wish list has proved so popular, but his success rate is exemplary. In designing this basically for the boss, Musical Fidelity has deliberately stayed away from making a ludicrous product, or one that is so complex that it would cost tens of thousands to build. The M6 Encore 225 has, at core, the amplifier of the M6si integrated amplifier and an M6si case (with a different front panel, of course), a slot-drive CD player that also rips to a built-in hard drive, and the lessons learned from the short-lived M1 CLIC streamer in the company’s portfolio. It connects to practically everything audio or computer-based in the home and is ideally designed to be driven by the company’s own app. There are two versions of the M6 Encore; the 225 integrated model tested here, and the M6 Encore Connect, which is designed to replace the source and preamplifier in an existing system. The two are functionally identical apart from the power amps, and it would be likely that the Encore Connect sounds marginally better than the 225 because of the absence of power amps in the one box. As we didn’t have both side-by-side, this remains speculation. Both versions of Encore are also designed to be fast. Navigating and accessing tracks through the app is blisteringly fast compared to most of its rivals, with no noticeable latency between Encore and iPad. Connection to other storage devices on the same network is quick, too, and the Encore allows both USB thumb-drives, and can charge its navigational iPad friend too. This speed comes at a bit of a cost. The Encores have heard of Plug ‘n’ Play, but want no part of it. There is no ‘automagically’ to the Encore (good thing too as it’s a terrible portmanteau word). However, that also means DLNA support doesn’t exist, which is kind of odd for a network player like this. This also means set-up and configuration is painstaking and not for the network illiterate. And if you move house or change networks, you need to actively remove the previous network details before installing the new ones. I guess Antony is a one-house kind of guy. Similarly, the process for storing your own music files or rips from the onboard disc player is not automated, and instead requires you dragging and dropping the files on the player’s local webpage using Google Chrome. It’s second nature once you get used to the process, and is reliable, robust, and fast, but runs counter to the normal automated process. It’s a bit like manually editing metadata on each album to fit your own file-sorting system; it’s probably the right way of doing things, but it’s far from the easiest way. This is getting the negatives out the way up front because the rest of the story is much more entertaining. The Encore has 1TB of onboard storage as standard (this can be upgraded, with twice the storage for an extra £80), and includes TIDAL integration and comes with a touchscreen (that in the photos supplied seems to have been replaced with some kind of postcard of London) and web integration that makes the product both quick to use and intuitive... after a while. The Encore 225 is very modal in operation. You touch one of the hard buttons to switch to a menu screen where what looks all the world like touchscreen buttons are on display, which you actually control with the dial and buttons. Again, this is Antony-logic all round: where most companies have taken the hard drive away to an external box (possible a network storage box) and are used to touchscreens, his thinking is to keep all the music under the one roof, and to rely on buttons and dials. I can’t help feeling that he’s actually speaking to a generation of people who grew up with CD and are reluctant to change because streaming is ‘more complicated’. It’s easy for net-savvy people (as in, practically everyone under the age of 50, and a few of us the other side of that great divide) to look at this viewpoint as that of a Luddite, but the fact remains people do state this view with remarkable frequency and they are being largely ignored by the audio industry. Musical Fidelity is being one of the rare exceptions, here.